Genealogy has become the number one hobby worldwide. Fascinated with family history? 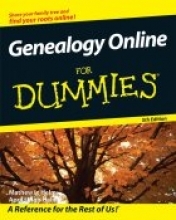 Now′s a great time to jump into genealogy, and this book makes it easy. What used to require endless shuffling (and sneezing) through dusty courthouse records can now often be done with your mouse, and you can share information with others who are researching related families. But be warned — genealogy is addictive! Part I: Getting Your Act Together. Chapter 1: Planning for Genealogical Success. Chapter 2: Getting to Know You (And Your Ancestors). Chapter 3: You Found It, Now Keep It. Part II: Focusing on Your Ancestor. Chapter 5: Bureaucracy At Its Best: Using Government Sources. Chapter 6: Going Beyond Borders: International Records. Part III: Adding Color to Your Research. Chapter 7: Your Ancestors: Here, There, and Everywhere. Chapter 9: Records Off the Beaten Path. Chapter 10: Fitting into Your Genes: Molecular Genealogy. Chapter 12: Giving Back to Your Online Community. Chapter 13: Finding Your Online Home. Chapter 14: Ten Tools for Your Genealogical Travels. Chapter 15: Ten Handy Databases. Chapter 16: Ten Things to Remember When Designing Your Web Site or Blog. Chapter 17: Ten Sites That Offer Help. Chapter 18: Ten Tips for Genealogical Smooth Sailing. Matthew L. Helm is the Executive Vice President and Chief Technology Officer for FamilyToolbox.net, Inc. He’s the creator and maintainer of the award-winning Helm’s Genealogy Toolbox, Helm/Helms Family Research Page, and a variety of other Web sites. Matthew speaks at national genealogical conventions and lectures to genealogical and historical societies. Matthew holds an A.B. in History and an M.S. in Library and Information Science from the University of Illinois at Urbana-Champaign. April Leigh Helm is the President of FamilyToolbox.net, Inc. April lectures on genealogy and other topics for various conferences and groups. She holds a B.S. in Journalism and an Ed.M. in Higher Education Administration from the University of Illinois at Urbana-Champaign. Together, the Helms have coauthored several books in addition to the five editions of Genealogy Online For Dummies. They include Family Tree Maker For Dummies, Your Official America Online Guide to Genealogy Online, and Get Your Degree Online.